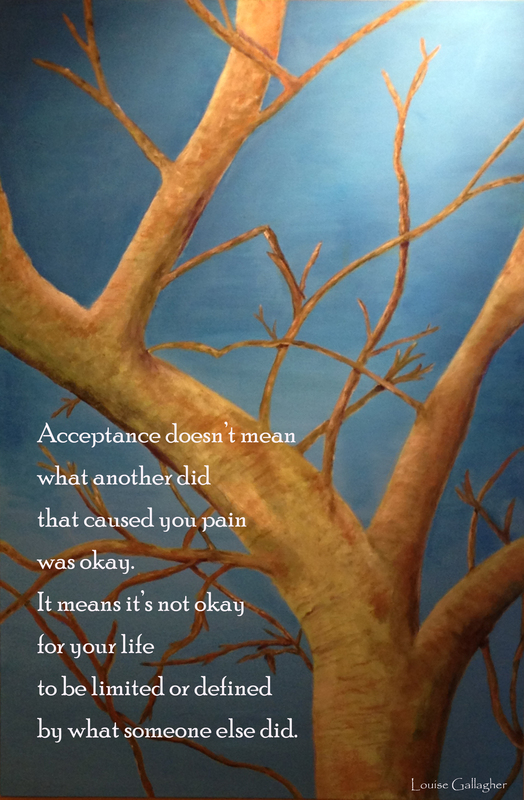 “What does acceptance mean to you?” I asked. Too often, we equate acceptance with being helpless. My friend was not helpless in this instance, and once she talked it through, she came up with several things she could do to ease her burdened heart and circle-thinking mind. Acceptance was found in the acknowledging the impact the other person’s behaviour had on her, and then, identifying where she had the power to not let their behaviour cause her to act without integrity, to contravene her own values. Acceptance was in recognizing that what the other person did was not a statement of my friend’s worth, but of the other person’s position. No matter what motivated the other, what they did caused harm to my friend. And that is not okay. Our outer lives and living are a reflection of our inner lives. When we are at peace within we are at peace without. My friend is not a violent person. She’d never hit another, even in that instance when she claimed she wanted to. It is not her nature. Violence is not a value she upholds. Yet, in her frustration and belief that acceptance means ‘accepting the other’s bad behaviour’, she felt powerless, helpless, confused. And in her confusion, she wanted to lash out at those who hurt her. It is human nature to want to right wrongs, correct mistakes, fix problems. We all make mistakes and sometimes, we don’t want to face our role in what has happened in our lives because we want someone else to be held accountable for what they did to cause the problems in our lives. I will never be powerful enough to make the man who abused me be accountable for what he did. I will never be powerful enough to change the past. I am powerful enough to be accountable for the harm and pain it caused my daughters and those around me and to create better today. I am powerful enough to let go of holding onto the need to avenge his wrong-doing and live freely in the beauty of today without letting revenge and bitterness steal my joy. I am powerful enough to accept I am not helpless. I am powerful beyond my wildest imaginings. When I let go of holding on to my fear of letting go of all the things I tell myself hurt me, I cannot change, or cannot let go of, I am free to live my life on the wild side of my dreams. When I accept that the change I want to create in the world begins with me, I fall with grace into Love. Categories: Essential Journey | Tags: acceptance, falling with grace, find your middle ground, letting go, Val Boyko | Permalink. I thank you for stopping in to say hello and share your support and courage Barb! Much love, many hugs and beans to you dear one. Acceptance, letting go and finding our inner power and peace…. a lovely reflection Louise.